Time-lapse imagery from July 9 to Sept. 13 2012 shows an ice island calve from Petermann Glacier and pass through Nares Strait. This time-lapse video shows the calving of an ice island from Greenland's Petermann Glacier and the drifting of the ice down the fjord and southward through Nares Strait. The images were captured by NASA's Terra and Aqua earth-observing satellites. This is the second time in three years that a city-sized hunk of ice has ripped off from the glacier. BBC : Petermann glacier in Greenland: Is it serious? B218 Jumentos - Hog Cay to Ragged Is. B151 Crooked Island Northshore- Bird Rock to Majors Hrb. Levels of radioactive contamination in fish caught off the east coast of Japan remain raised, official data shows. It is a sign that the Dai-ichi power plant continues to be a source of pollution more than a year after the nuclear accident. 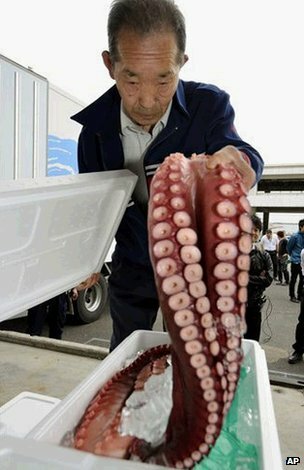 About 40% of fish caught close to Fukushima itself are regarded as unfit for humans under Japanese regulations. The respected US marine chemist Ken Buesseler has reviewed the data in this week's Science journal. He says there are probably two sources of lingering contamination. "There is the on-going leakage into the ocean of polluted ground water from under Fukushima, and there is the contamination that's already in the sediments just offshore," he told BBC News. "It all points to this issue being long-term and one that will need monitoring for decades into the future." Prof Buesseler is affiliated to the US Woods Hole Oceanographic Institution (WHOI). His evaluation covers a year's worth of data gathered by the Japanese Ministry of Agriculture, Forestry and Fisheries (MAFF). Its monthly records detail the levels of radioactive caesium found in fish and other seafood products from shortly after the March 2011 Tohoku earthquake and tsunami - the double disaster that triggered the Fukushima crisis. The caesium-134 and 137 isotopes can be traced directly to releases from the crippled power station. The caesium does not normally stay in the tissues of saltwater fish for very long; a few percent per day on average should flow back into the ocean water. So, the fact that these animals continue to display elevated contamination strongly suggests the pollution source has not yet been completely shut off. He notes that although caesium levels in any fish type and on any day can be highly variable, it is the bottom-dwelling species off Fukushima that consistently show the highest caesium counts. For the WHOI researcher, this points to the seafloor being a major reservoir for the caesium pollution. "It looks to me like the bottom fish, the fish that are eating, you know, crabs and shellfish, the kinds of things that are particle feeders - they seem to be increasing their accumulation of the caesium isotopes because of their habitat on the seafloor," he explained. Prof Buesseler stresses however that the vast majority of fish caught off the northeast coast of Japan are fit for human consumption. And while the 40% figure for unsafe catch in the Fukushima prefecture may sound alarming, the bald number is slightly misleading. 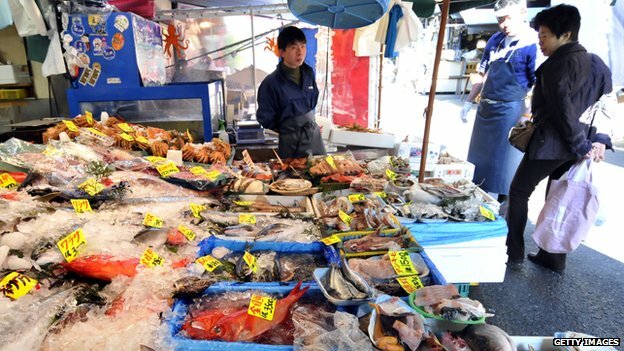 Last April, the Japanese authorities tried to instil greater market confidence by lowering the maximum permitted concentration of radioactivity in fish and fish products from 500 becquerels per kilogram of wet weight to 100 Bq/kg wet. This tightening of the threshold immediately re-classified fish previously deemed fit as unfit, even though their actual contamination count had not changed. It is also worth comparing the Japanese limit with international standards. In the US, for example, the threshold is set at 1,200 Bq/kg wet - significantly more lenient than even the pre-April Japanese requirement. And Prof Buesseler makes the point that some naturally occurring radionuclides, such as potassium-40, appear in fish at similar or even higher levels than the radioactive caesium. Nonetheless, the contamination question is a pertinent one in the Asian nation simply because its people consume far more fish per head than in most other countries. "At one level, there shouldn't be any surprises here but on another, people need to come to grips with the fact that for some species and for some areas this is going to be a long-term issue; and with these results it's hard to predict for how long some fisheries might have to be closed," said the WHOI scientist. Prof Buesseler, with Japanese colleagues, is organising a scientific symposium in Tokyo on 12/13 November to present the latest thinking on Fukushima and its impacts on the ocean. The information will then be shared with the public in a free colloquium on 14 November.d be opened or closed (it is not a measure of contamination in actual market fish). A page from the log book of the US Navy steamer Bear, June 22, 1884. The Bear's logs are included in the Old Weather-Arctic citizen science project. Would you like to help NOAA climate scientists with an innovative new project that will help us better understand how the climate is changing? Do you love weather and history and have a computer and Internet connection? Before there were satellites, weather data transmitters, or computer databases, there were the ship’s logs of Arctic sea voyages, where sailors dutifully recording weather observations. Now, a new crowdsourcing effort could soon make of the weather data from these ship logs, some more than 150 years old, available to climate scientists worldwide. NOAA, National Archives and Records Administration, Zooniverse — a citizen science web portal — and other partners are seeking volunteers to transcribe a newly digitized set of ship logs dating to 1850. The ship logs, preserved by NARA, are from U.S. Navy, Coast Guard and Revenue Cutter voyages in the Arctic between 1850 and the World War II era. “We hope to unlock millions of weather, sea ice and other environmental observations which are recorded in these documents,” said NOAA Administrator Jane Lubchenco, Ph.D.
Organizers hope to enlist thousands of volunteers to transcribe scanned copies of logbook pages via the Old Weather project with an eye to Information recorded in these logbooks will also appeal to a wide array of scientists from other fields – and professionals from other fields, including historians, genealogists, as well as current members and veterans of the U.S. Navy and Coast Guard. The Old Weather collaboration will provide free online access to primary documents, new data resources, and analysis tools. Old Weather is one of a suite of projects produced, maintained and developed by the Citizen Science Alliance and accessible online through Zooniverse. Citizen Science Alliance member institutions work with academic and other partners around the world to produce projects that use the efforts and ability of volunteers to help scientists and researchers deal with the flood of data that confronts them, explained Philip Brohan, UK Met Office climate scientist and leader of the Old Weather project. The National Archives will host digital images from all the logbooks in this collaboration on its website. This three-way collaboration not only makes the logbooks available to Old Weather citizen scientists and NOAA researchers, but also to anyone with Internet access who wishes to explore the diplomatic, scientific, technological and military aspects of the voyages, as well as accounts of dramatic rescues and tragic losses. “The logbooks not only capture operations of U.S. government ships,” said Ferriero, “They are an important cornerstone to researching U.S. and global history of any type." The USS Jeannette's logs are part of the Old Weather-Arctic project. The ship was entrapped in Arctic sea ice for many months. Only a few sailors and the logbook survived this doomed 1879 Arctic expedition. The Old Weather project began in 2010. Since then, 16,400 volunteers have transcribed 1.6 million weather observations from British Royal Navy logbooks – work that would have taken one person many years to complete. Now, Old Weather is taking on the National Archives’ extensive collection of logbooks, with an initial focus on ships that operated in the Arctic. Old Weather-Arctic will start off with roughly 100,000 logbook pages that include an estimated one million new-to-science observations. Participants in Old Weather-Arctic will be able to work with the logbooks of the doomed 1879 USS Jeannette Arctic expedition, the Revenue Cutter Thomas Corwin that carried the famous naturalist John Muir to the far North in 1881, and the Coast Guard cutter Bear that sailed the coasts of Alaska for nearly 50 years. Many other ships, whose logs will be added in coming months, engaged in a variety of both unusual and useful work-a-day tasks in the Arctic. For years, scientists at the NOAA Pacific Marine Environmental Laboratory (PMEL) in Seattle have been studying the Arctic climate and working to establish historical Arctic climate baseline data. However, much of the older data exist only in hand-written documents inaccessible to most scientists. Last year, researchers at PMEL and the Joint Institute for the Study of the Atmosphere and Ocean, a partnership between NOAA and the University of Washington, approached the National Archives about digitizing its unique collection ship logbooks. With funding from the North Pacific Research Board and the National Science Foundation, Old Weather-Arctic began taking shape. For several months, a small team of specially trained student interns worked with Archives’ staff to photograph the old ship logbooks, page-by-page, at a dedicated NOAA imaging station at National Archives facilities in Washington, D.C. and College Park, Md. Zooniverse has uploaded the ship log images to the Old Weather website, where volunteers can now transcribe the weather observations and any other interesting reports they might find. Project scientists will integrate the transcribed data produced by Old Weather volunteers into existing large-scale data sets, such as the International Comprehensive Ocean Atmosphere Data Set, which are used by researchers around the world. Visit us at www.noaa.gov and join us on Facebook, Twitter and our other social media channels. The National Archives and Records Administration is an independent federal agency that preserves and shares with the public records that trace the story of our nation, government, and the American people. From the Declaration of Independence to accounts of ordinary Americans, the holdings of the National Archives directly touch the lives of millions of people. The National Archives carries out its mission through a nationwide network of archives, records centers, and presidential Libraries, and online. It was only a matter of time before somebody broke the fragile social and political consensus surrounding geoengineering, and had a first crack at "experiment Earth". The news that American businessman Russ George has dumped 100 tonnes of iron sulphate into the Pacific Ocean in an attempt to fertilise algal blooms that absorb carbon dioxide, was received with justified indignation and outrage by campaigners and mainstream scientists. But there have been rumblings (and rumours of shadowy trials) for many years, and the idea of being a "geoengineer" was always going to prove tempting for the likes of George (who is blacklisted at several international ports for previous algae-related misdemeanours). near the shores of ferry hotspot Skidegate on Oct. 3, 2012. Geoengineering – the possibility of using large-scale technologies to counteract the effects of climate change – has arrived. The question is, are we ready for it? From a scientific perspective, the answer is "not yet". Very little is known about any of the technologies that we might one day use to seize control of the global thermostat. Some sound like science fiction and will probably remain that way. operating on a global scale. Yellow and brown colours show relatively high concentrations of chlorophyll off the coast of Haida Gwaii, B.C., in August, 2012, after iron sulphate was dumped into the Pacific Ocean as part of a controversial geoengineering scheme. But the big questions, for now, have less to do with science and more to do with politics, as the Canadian iron dump illustrates so well. The ingredients of a classic controversy are all there - a wealthy, gung-ho businessman; a misled and powerless local population; an allegedly complicit government and a blanket of secrecy over the whole affair. Research has shown that these are the kinds of issues that people are concerned about. And with individuals like Russ George around, who can blame them? The prospect of geoengineering raises fundamental questions about whether we are capable of actively, co-operatively and equitably managing the global commons. This is new territory: whereas the risks of a nuclear disaster are potentially global, the risks of geoengineering are inherently so. Are we ready to govern technologies that if ever deployed, would need to be maintained for decades – or perhaps even centuries – in order to keep temperatures down and the climate stable? The history of the past century suggests that we are in no position to manage technologies on this scale, or even keep rogue researchers in check. In fairness, there are some serious efforts underway to anticipate the governance challenges that geoengineering will raise, and to involve public and civil society voices in debates about how – or even if – geoengineering research should go ahead. But thanks to a characteristically weasel-worded UN text, there is precious little clarity about the level of geoengineering research permitted under international law, allowing George to describe two widely cited moratoria on ocean fertilisation as "a mythology". But rogue experiments like this vindicate their warnings – and may compromise the integrity of the whole field in the eyes of the public. The vast majority of scientists working on geoengineering are well aware of the ethical implications of their research, and are reluctant to suggest that they have sensible answers to climate change. But a handful are more enthusiastic, and outside of the scientific community, there are plenty of people itching to promote a climate "fix", because geoengineering offers a method of tackling climate change that doesn't require asking any difficult questions about unsustainable systems of production and consumption. In the US, rightwing pressure groups like the Heartland Institute have thrown their weight behind geoengineering as a "cost effective" solution to climate change, which is an incredibly telling insight into supposed climate scepticism. So often, a rejection of the science of climate change is just a proxy for a dislike of the policy implications. For those who object to the social engineering of behaviour change or regulation, geoengineering is a preferable option. It is the politics of climate change – not the science of geoengineering – that led to the iron dumping . Although artificial algal blooms are likely to have a range of unanticipated side-effects, it is not difficult to see how carbon captured through ocean fertilisation could easily be transformed into lucrative credits and fed into global carbon markets. And this possibility – profitable colonic irrigation for the planet – is simply too tempting for a rogue geoengineer to resist. The Canadian Coast Guard Cutter Louis S. St. Laurent working in the Beaufort Sea,seen from the USCGC Healy on the 2010 International Extended Continental Shelf Survey. 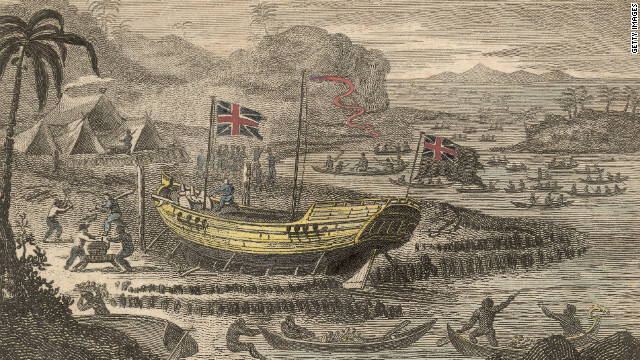 Arctic explorers may have come up empty-handed in the search for Sir John Franklin's lost shipwrecked vessels, but the research they did will help future mariners navigating the treacherous the Northwest Passage. But in a bit of Arctic irony, work done during the search in Nunavut will help future mariners navigating through the icy and dangerous waters where HMS Erebus and HMS Terror may have gone down. Hydrographers who were part of the search gathered enough depth and multi-beam sidescan sonar data to create a preliminary electronic chart that expands the area for safe navigation in Alexandra Strait, reducing travel time and saving fuel costs for vessels in the area. Andrew Leyzack, the Canadian Hydrographic Service's hydrographer-in-charge during the Franklin search, says this past summer's result is significant. Not only will it help reduce travel time for vessels around King William Island by six or seven hours, but it could also provide an alternative navigation route in case of ice in the lower Victoria Strait. "The time savings and the fuel savings are considerable," says Leyzack, who noted the new route could also be useful if a vessel runs into trouble. "In the event of a search-and-rescue call, it just cuts off that much more time if the responding vessels could transit this route as opposed to going all the way around the Royal Geographic Society Islands." The new chart — which Leyzack likens to a multi-lane highway replacing a dirt road — will guide ships from Victoria Strait to Storis Passage and comes as the Canadian Hydrographic Service faces increasing demands for mapping and updating navigational charts for the Arctic. And just as economic dreams fuelled Franklin's ultimately doomed quest to find the Northwest Passage, a fiscal motivation lies behind the mounting pressure for better charts. Interests ranging from oil and gas exploration and resource extraction to tourism want to take vessels to new areas and in greater numbers. Add the impact of changing climate, and retreating ice patterns, along with the desire to do what it takes to avoid shipping accidents and their associated potential environmental threats and salvage costs, and the CHS is under no illusion about the demand for its services. But don't expect charts showing every detail of the Arctic seabed north of 60 degrees latitude — an area of about seven million square kilometres — any time soon. "Canada has the longest coastline in the world and we have three oceans and the Great Lakes," says Savi Narayanan, the CHS's director general. "It is totally unrealistic to have all the areas fully charted to modern standards where any ship can go anytime." So the service has been setting priorities. Ten years ago, the Arctic didn't rank very high. But that's changed in the past decade, with the increased Arctic oil and gas exploration, tourism and more traffic in the northern waters. "We realized we need to have enhanced charting in the Arctic," says Narayanan. Tim Keane, vice-president of Enfotec Technical Services, a subsidiary of the Montreal-based bulk shipping company Fednav that specializes in ice analysis and vessel routing, says there are areas within the Northwest Passage where there are scant soundings. "It could benefit from more extensive soundings to determine exactly how much draft a ship can carry through that area." Shippers don't want to go where they have little guidance about what might lie underneath the water's surface. "There are vast areas where there are no surveys or nothing in any chart that would indicate that the area has been well surveyed, so you are restricted in terms of navigating," says Keane, whose firm works with mining developments that would require bulk shipping in the North, such as Baffinland's Mary River iron mine. "Any prudent navigator will never put his ship into a position where he's outside of a known charted area." For the CHS, charting priority is focusing on the main existing navigational channels. "The area where Parks Canada would like to search for the Franklin ships is also an area of high priority for charting because that is one of the navigational corridors and it's a really high-risk area because of the weather conditions and the ice conditions," says Narayanan. Only about 10 per cent of the total Arctic has been charted and surveyed to a modern standard. Twenty-five to 35 per cent of the main Arctic shipping routes are surveyed and charted to that standard, says Narayanan. Retreating Arctic ice has also influenced how the service is determining where to focus its resources. "Of course climate change is a factor in determining where we need to do charting or where the traffic will go, because we need to make sure that we provide the information ... to prevent accidents," says Narayanan. In terms of climate change, she says, the ice retreat will happen more on the Russian side of the Arctic, rather than the Canadian, because of the way the water moves in the Arctic Ocean. During this summer's Franklin search, hydrographers completed 266 square kilometres of seabed mapping using multi-beam sonar systems on two survey vessels, meeting the CHS's goal for coverage from those boats. Another 74 square kilometres of mapping was done from the research vessel Martin Bergmann. That was about half the area expected and largely a result of equipment breakdowns that cost about 80 hours of production time. An autonomous underwater vehicle provided by the University of Victoria covered about 4.5 square kilometres, not a huge area, but one Leyzack considered a "bonus" because it was the first time the AUV had been deployed during the service's annual Arctic charting. This year's CHS work was part of a three-year plan. Leyzack expects hydrographers will likely be back surveying next summer. "Each year reveals more clues regarding Canada's Arctic geography," he says. "With the rising number of cargo ships transiting the Northwest Passage, I think it's rather relevant that we're here doing this and gathering all the information possible about the environment ... not only with a goal to protect the environment, but also to make marine safety our top priority." Imagine the data you'd get from recording the original Captain's logs from every Royal Naval vessel from the First World War: location, temperature and time providing a unique record of climate change. The excellent Old Weather has been crowdsourcing every one of those log books - and the result, is a fascinating insight into the British Empire at war - albeit of the records which have survived. 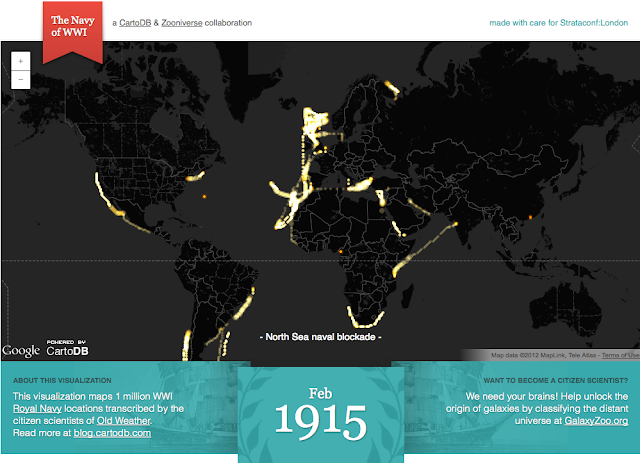 By adding the subtitles, the temporal map of naval history really puts a lot of the spikes and bursts of activity in perspective. The labels are not currently something built into the library, but we will work on it in the coming weeks. We couldn’t even fit all the neat things we saw, passing through the Panama Canal, explorations up rivers in China, trips across the Pacific. Today, around 90% of world trade is currently carried by the shipping industry, contributing to 4% of global carbon emissions. "The model we have now of shipping is unsustainable -- for business and the environment"
With their billowing sails, towering masts and long wooden hulls, 19th century clipper ships were staggering feats of design -- and Europe's lifeline to the world's most exotic goods. One of the best known trading companies of the era was Britain's East India Company. This historic painting depicts the company's Captain Henry Wilson shipwrecked on the Pelew Islands, later the Republic of Palau, around 1783. Laden with spices, teas and chocolates from across the globe, the use of these wind-powered sailing vessels reached its peak during the late 1800's, a period often referred to as the "Golden Age of Sail." Abandoned in the advent of steamboats, the centuries-old transport is now enjoying a revival among cargo traders, with a new breed of merchant ships returning to wind power in an effort to promote environmentally sustainable trade. 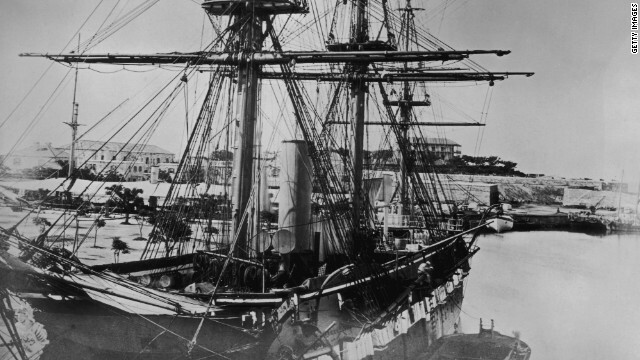 The merchant ship Challenger, pictured in Bermuda in 1865. Spices, tea and chocolate from across the globe were delivered in ever increasing quantities to the dining tables of Europe, as the ships became larger and more efficient. 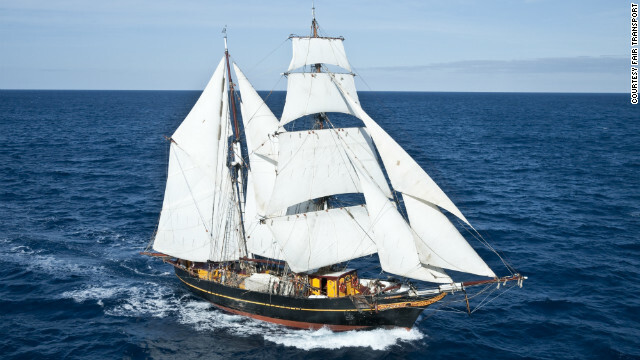 This week, the 32-meter brigantine Tres Hombres set sail from the Netherlands to the Caribbean in an eight-month voyage transporting ale, wine, rum and chocolate -- much the same way as merchant ships would have done 150 years ago. Named in honor of the three friends who founded the ambitious scheme, the 35-ton carbon-neutral vessel has no motor and relies on solar-powered fridges to keep its cargo cool. "A lot of shipping companies are going bankrupt because fuel is so expensive," said one of the ship's founders and co-captain, Arjen van der Veen. "The model we have now of shipping is unsustainable -- both for business and the environment. We chose a traditional rig because it's a beautiful design and we wanted to show people sailing can still be effective." From its base in Den Helder in the Netherlands, Tres Hombres will head to Brixham in England where it will pick up 100,000 bottles of ale, delivering them to Douarnenez in France. From there it will sail to ports across Europe and the Caribbean, transporting 500 liters of wine, 50,000 chocolate bars, 4,000 bottles of rum and 5-tons of cocoa beans in a round trip. All the cargo is organic, making it eco-friendly from the moment it is produced to the moment it lands on the supermarket shelf, Van der Veen explained. "The whole chain of production is sustainable," he said. "For companies, it makes their goods unique. It's a little more expensive but people are willing to pay because it has no carbon footprint." The 19th century "Golden Age of Sail" could be experiencing a revival. Modern-day cargo ship, Tres Hombres (pictured), is relying solely on wind power for its eight-month voyage to the Caribbean. The Sail Transport Network (STN), a green travel campaign group, is now looking to create a sustainable transport certificate, much like the "Fair Trade" and "Organic" stamps found on other foods. STN founder Jan Lundberg predicts that wind-powered cargo ships will soon be the norm as the world's fossil fuel supplies continue to diminish. "The accelerating rate of change in the economy and finance, the peak oil factor and the climate crisis are all tipping factors. If more people sense this soon, you could see a jump in sail transport investment," he said. "Many smaller older cargo vessels are idle today and are also being recycled -- these are realistic candidates for conversion to sail." Recent figures show there is much at stake when it comes to sustainable transport on the high-seas. Around 90% of world trade is currently carried by the shipping industry, according to the International Maritime Organization. The industry contributes 4% of global carbon emissions, United Nations figures show. Indeed, it says that if shipping were a country, it would be the sixth-largest emitter of greenhouse gases in the world. But it could be that the winds of change are on the horizon. From January next year, new International Maritime Organization regulations will require shipping companies to cut emissions by 20% over the next seven years and a further 50% by 2050. 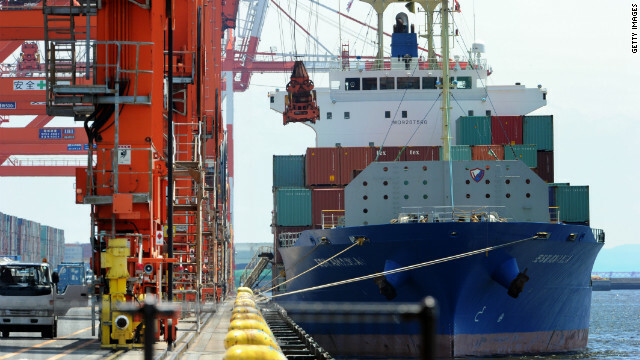 "By 2025 all new ships have to be 20% more efficient, so shipyards will also be compelled to produce more fuel-efficient vessels," Simon Bennett of the International Chamber of Shipping said. "What's also important is that fuel costs have risen 400% since 2000 -- the operating costs are huge. In any case, every shipping company wants to reduce its emissions." With these environmental concerns in mind, Van der Veen and his fellow Dutch captains Andreas Lackner and Jorne Langelaan set about building the Tres Hombres in 2007, using the hull of a former passenger ferry in the Aran Islands off the coast of Ireland. Completed in 2009, this is Tres Hombre's fourth trade trip after previous voyages across western Europe, the Caribbean and even delivering relief aid to Haiti after the 2010 earthquake. Tres Hombres managing company, Fair Transport, also hopes to build a 136-meter cargo ship which would use at least 50% wind power. A diesel and electric motor would provide power in less windy conditions. The trio are certainly not alone in their quest to find green alternatives to the gas-guzzling cargo vessels of the 21st century. 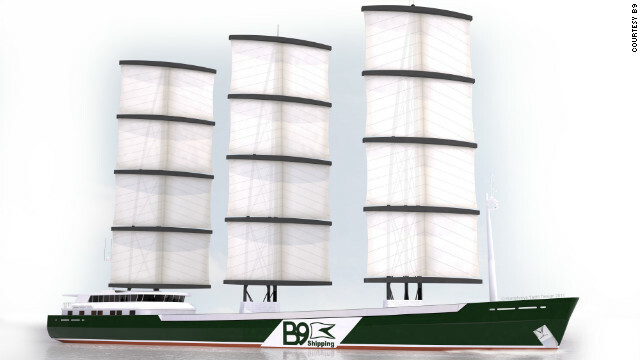 British wind power company B9 recently tested a model of its planned 100-meter, 3,000-ton carbon-neutral freighter. The ship would use 60% wind power, relying on three computer-operated masts rising 55-meters -- as tall as a 14-storey building. This would be supplemented by a bio-gas engine converting food waste into methane; the food waste being anything from restaurant slops to out-of-date sandwiches. B9 co-director Diane Gilpin said the design would best suit smaller vessels, and they are now looking for between $30 million and $45 million in funding to get it off the ground. British wind power company B9 recently tested a model of its 100-meter, 3,000-ton carbon-neutral freighter. 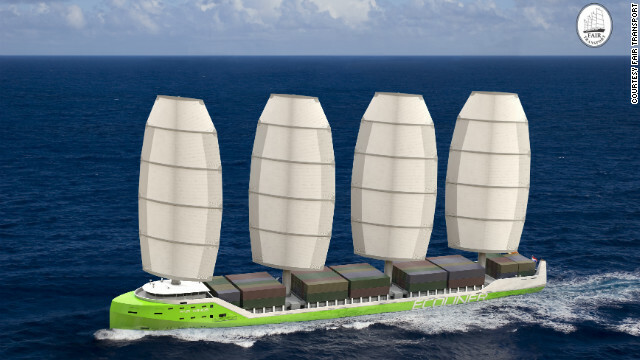 The ship would use 60% wind power, relying on three computer-operated masts rising 55-meters. "In the last 100 years we've been absolutely besotted with what oil can do for us," she said. "Now we're running out of fuel and we have to be a little bit cleverer about how we deploy our ships." She admits it will be a challenge changing the traditionally conservative shipping industry, but added: "If we're looking at a new, green, industrial revolution, those early movers will benefit from being there at the outset." As Van der Veen said when the Tres Hombres crew first floated the idea of a engine-less cargo ship: "Everybody thought it was crazy but we've proved them wrong. "It's so satisfying -- it's part of our goal to make a transport revolution." Every year in June Tiger Sharks swim thousands of miles to the French Frigate Shoals, just in time to find Albatross chicks beginning their first attempts to fly.